A thrilling retelling of the star-crossed tale of Romeo and Juliet, from the New York Times bestselling author of the Morganville Vampires series. In the Houses of Montague and Capulet, there is only one goal: power. The boys are born to fight and die for honor and—if they survive—marry for influence and money, not love. The girls are assets, to be spent wisely. Their wishes are of no import. Their fates are written on the day they are born. …And will rewrite all their fates, forever. First Line:"I stood in the dark corner of my enemy's house, and thought of murder." 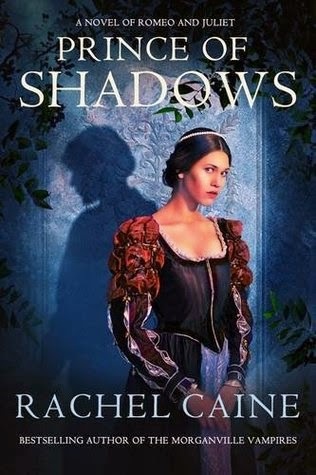 Review: I had no real expectations going into Prince of Shadows, I know the author is popular but I've never read any of her books and Romeo and Juliet is a tale that I have a love hate relationship with so with all that said I was surprised with how much I loved it. First and foremost I went in thinking the book was going to be filled with some hot and heavy romance between Rosaline and Benvolio but there wasn't much romance at least not until more towards the end. The book instead focused on Benvolio the Prince of Shadows the most notorious thief in Verona and everything was told from his perspective. It's written in the same timeline as Romeo and Juliet with a whole bunch of new things and a few new faces that we never heard of in the original tale by Shakespeare. You really get to see how childish and immature Romeo can be from Benvolios perspective and speaking of our main character I loved him, by far one of the more interesting male point of views I have read in a long time. I really enjoyed Caine's take, for example the infamous line "A curse on both your houses" in Prince of Shadows not only was there a curse but there was a witch involved as well and we see the curse truly play out to the end even after Romeo and Juliet's demise, the curse continues and it falls on Benvolio and Rosaline to end it. Also we get a more detailed understanding of some of the key players such as Tybalt and Mercutio and a few others. Overall an excellent read and I loved the story of Benvolio and Rosaline.